What Will You Do With Your Time, Talent & Treasure? Parish Stewardship has something NEW this year! A professional movie showing what Western Washington parishes are doing to live Stewardship as A Way of Life. Learn what Stewardship can mean in your parish! Watch the video in English or in Spanish. Why Do We Need To Teach Stewardship? Throughout sacred scripture God calls us to be a giving people. The concepts of giving God our "first fruits" and of tithing a fair percent were first mentioned in the Old Testament. About half of Our Lord's parables address the proper use of our resources and Jesus talks about money five times more than He talks about prayer. Generous giving is fundamental to our faith tradition. Any parish that truly wants to follow the teachings of Our Lord must teach and embrace stewardship. As the US Catholic Bishops' write in their Pastoral Letter on Stewardship, Stewardship: A Disciple's Response, "Once one chooses to become a disciple of Jesus Christ, stewardship is not an option." From the awe-inspiring European basilicas to the smallest rural churches in our own country, all of the churches, schools, hospitals and other Catholic agencies which we take for granted today have been built by previous generations giving generously of their time, talents and treasure. Auctions, raffles and golf tournaments did not build up the Church and they cannot maintain it. The Church today was built up because our ancestors in faith understood their responsibility to support the establishment of God's kingdom here on earth. They made God a priority in their lives and they generously shared no matter how much or how little they had. How Does My Parish Stewardship Giving Differ From The Annual Catholic Appeal? What Does My Stewardship Support? Our parish and mission church serve the needs of most Catholics on the Plateau. When you give your gift of Time, Talent and Treasure, your efforts go to support everything your parish needs to help minister to the Catholic community on the Plateau. Our Parishes are direct recipients of the ministries supported by your generous donation of Time, Talent and Treasure. Diligent maintenance by dedicated volunteers has kept our parishes in very good condition for their age. There are still many more areas that need to be addressed since St. Aloysius and Our Lady of Lourdes parishes are over 100 years old. 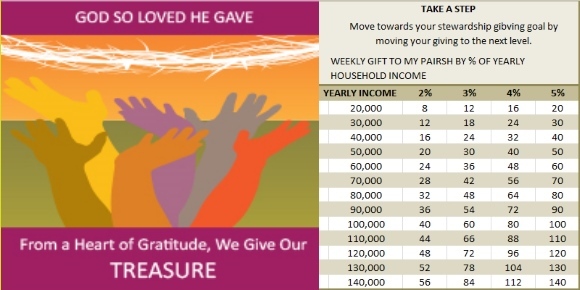 How Much Should I Give To My Parish Stewardship? The chart above provides a guideline for deciding the portion of your planned giving based on your household income. Each year, we ask you to reflect and re-evaluate your financial giving - is it a gift that is planned, proportionate, sacrificial and thankful? An equal percentage should be considered for giving to the 'other half' such as Special Collections, the Annual Catholic Appeal and other charities. If you haven't already decided on your parish stewardship commitment, please prayerfully consider your giving and return a commitment card to your parish office, through the mail, or in the collection basket.